Want to get the perfect swing every time? Do you remember when golf used to be a relaxing, fun activity meant to be a diversion from the stresses of everyday life when you used to enjoy going to the driving range or the course and tagging a few balls? 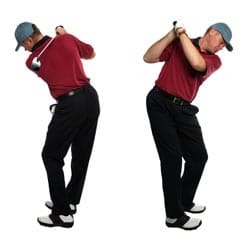 Then somewhere down the road your competitive juices started to flow and you started to notice (or others brought it to your attention) that your swing just wasn’t perfect. This is when the activity became a “game“, one that you wanted to excel at and of course master… perhaps even one day wearing that green “Masters” jacket! Let’s face it! Even there are things that give us the greatest enjoyment that we do to relax, we would also like to be very good at them. Why else would anyone want to do anything just mediocre and careless? In the real world of pro golf, putting is for the dough, but… driving is for show and that is what our focus is on here – improving your driving game! Even though a golf swing is very mechanical, it is more mental in that it requires two very important things; visualization and memory. Let’s first start with the visual in that you need to “see” yourself making the shot by knowing exactly where you want the ball to go. In the process of visualization, you first make the shot in your mind before doing the real thing whether it be teeing off, stroking on the fairway or putting. Visualization is all about expectation in that you know you will make the shot you are aiming to make. Second, comes the memory part. Once you make a great shot, you make a “mental” note of how you did it and file it away. You do this for your drives as well as your putts. Did you know that your body possesses what is called “muscle memory?” What this means is that after you do something continually, your mind processes this and makes a mental file for how to do it again. Actually it can be through hypnosis training! In golf, you do so many things perfectly and imperfectly that your mind can become overwhelmed with ideas on how to do things correctly. When under pressure, you are more likely to become stressed and with that comes errors. Hence, the mind draws up mental muscle memories tied to errors or bad habits – you know, slicing he ball to the right, or over putting! With hypnosis, you can not only teach your mind to relax, but while in that relaxed state, the ability to tap into those memories that draw upon the “perfect” shots. This allows positive muscle memories to come into play and make perfect shots whether on the fairway or the putting green. The best part of hypnosis is that you can experience results immediately. This can be accomplished under the guidance of a trained hypnotherapist, or through using CDs in your own home.